I love it! It looks beautiful over my fireplace in my living room. Prompt shipping and delivery. It was easy to hang/not too heavy for me to do by myself. 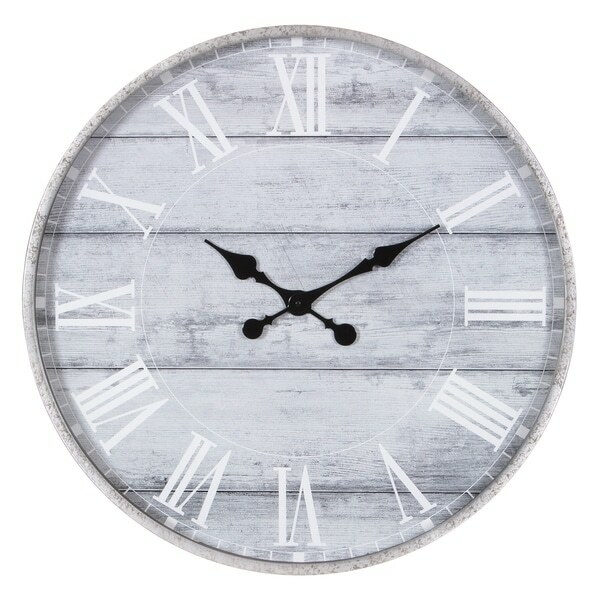 Add a farmhouse rustic touch to you decor with this 28" Galvanized Metal Gray Washed Wood Plank Round Wall Clock. Inspired by vintage time pieces, this wall clock blends traditional and vintage style seamlessly. Constructed of durable metal in a lightly distressed galvanized finish, the clock face features a woodgrain background in a distressed grey washed finish with large easy-to-read white roman numeral numbers. Hangs securely to any wall surface with durable hanger on back. Requires one AA battery. Dimensions 28.0 In. X 1.75 In. X 28.0 In.